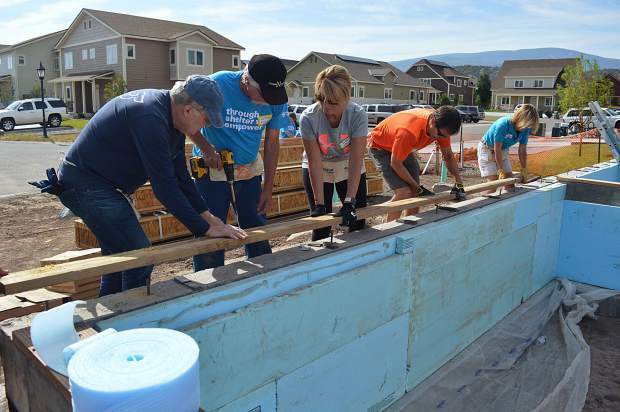 Habitat for Humanity Vail Valley hosted its first CEO Build Day. Local business leaders volunteered to help build Habitat homes. From left, these volunteers are: Jim Haymaker; Jan Olewnik; Colleen Weiss, CEO East West Partners; Bret Hooper, Habitat for Humanity Vail Valley vice president and Edwards Jones financial consultant, Kathy Chandler-Henry, Habitat for Humanity board member and Eagle County commissioner. Habitat for Humanity builds simple, decent, affordable homes in partnership with local families in need. They’re accepting applications for partner families. For more information on Habitat for Humanity Vail Valley, or to donate money, real estate or to volunteer, visit www.habitatvailvalley.org or call 970-748-6718. GYPSUM — It happened as it usually does during Habitat for Humanity build days: Toward the end of the day, as the work winds down, volunteers stepped back to look at what they had accomplished. Thursday, July 19, was the local Habitat affiliate’s CEO Build Day. Local and regional business executives who handle hundreds of people and millions of dollars each day gladly traded their business attire for blue volunteer T-shirts and their spreadsheets for hammers, saws and other construction tools to work all day in the hot sun. Even more, they were happy to be there. “This chapter of Habitat for Humanity is amazing, and their ingenuity just continues,” said Kristin Williams. It’s good to know why you’re working, whether you’re swinging a paintbrush or a P&L statement. So before they started early Thursday morning, they heard from Modesta Serna, one of the partner families whose home they are helping build. Serna is an Eagle County native and raised her daughters here. “Through life’s journey, I found myself facing having to leave here because I could not afford to stay here,” Serna said. One of her friends was already a Habitat partner, so she asked him about it. She filled out an application last fall and waited from September to May to learn that she had been selected. “I’m so excited. It’s a place my kids and I can call our own,” Serna said, pointing to her home. Her kids are 19, 13 and 3 years old. They move in next month. “We all help each other,” Serna said. Mary Lynn Staley and her family call the Vail Valley home. Lynn is vice chair of Habitat for Humanity International’s regional board and has been on builds in South Africa, Thailand, Mexico and other exotic climes such as Gypsum, Edwards and Minnesota — at least those are the ones she could quickly recall while she was standing in a crawl space installing hangers for floor joists. Like everything else in life, the foundation must be done correctly. 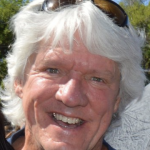 If it’s not, then things become exponentially harder, observed John Welaj, Habitat Vail Valley CEO. So far, Habitat volunteers have built 74 homes in the Vail Valley, providing homes for more than 250 children. “Support runs deep in this valley,” said Elyse Howard, development director for Habitat Vail Valley. Right now, they’re building six homes per year. They want to increase that to eight homes per year by 2021. They’re negotiating for lots to build 36 more homes in Gypsum’s Stratton Flats neighborhood and have cut a deal with the school district to build homes between Gypsum Creek Middle School and Red Hill Elementary School for eligible school district employees. “Because they’re already so deeply engaged in the community, they’re great partner families,” Howard said. Partner families have to work at least 250 hours building their new homes — “sweat equity” is what Habitat folks call it. On Thursday, Serna had topped 500 hours. Habitat partner families buy their homes with zero-interest loans and payments based on 30 percent of their income. Homes and families is the answer.